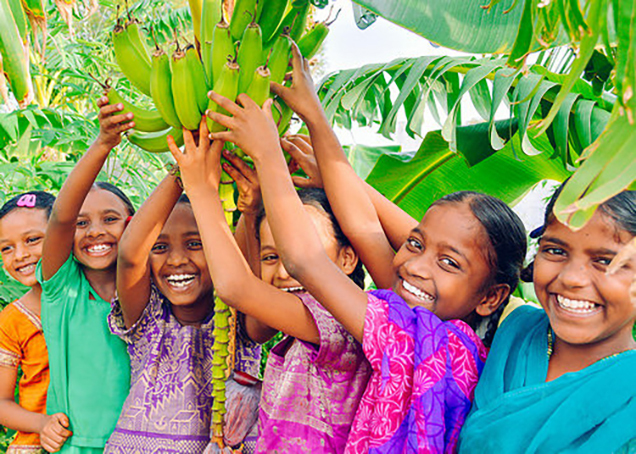 Photo: Children at our India Girls Home are thankful for a bountiful banana harvest! We are happy to report that plans are underway to cover every available square foot of the main India campus with gardens, including a rooftop box gardening project. 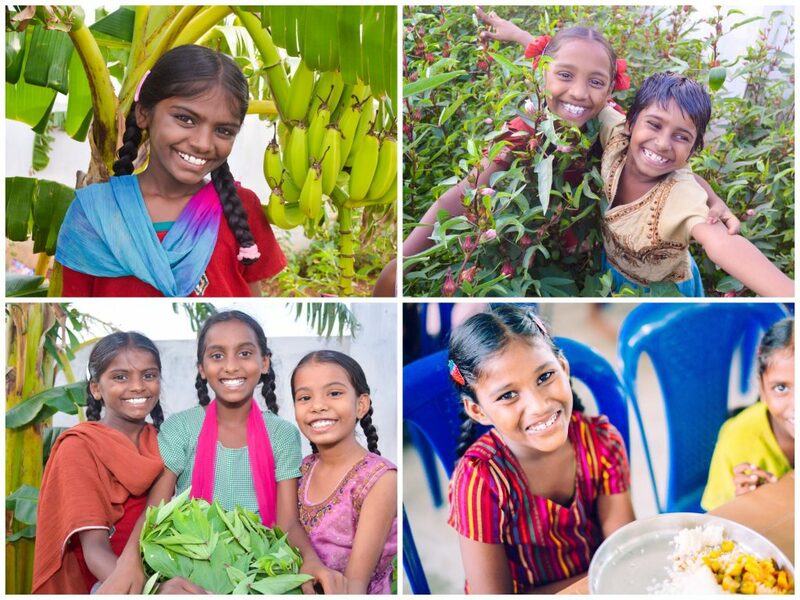 These projects are an effort to introduce more fresh organic vegetables and herbs into our children’s diets at the Girls Home and Boys Home, beyond what our 14-acre farmland is already producing. As the farmland is quite a distance away from our main campus, our on-campus gardening projects ensure a reliable way to provide vegetables straight into our orphanage pantries without delay or complication. In our existing gardens at the ground level we are growing eggplant and beans; local varieties of squash, okra, cucumber, tomatoes, and chilies; and a variety of curry leaves which we use in cooking meals for the orphans. We also have a small banana grove which yields an annual harvest of almost 1,000 bananas. The banana grove produces a mixture of varieties, including what we call locally in India “curry bananas” otherwise known as plantains. Bananas are especially good for the children as they contain plentiful amounts of potassium, fiber, and vitamins C and B6. We are in the designing and planning stages of our new rooftop box gardening project. As our campus land is limited, and we don’t want to take away play space from the children, we are utilizing the rooftops to maximize our green space. A consultant is visiting the campus this week to begin the work. All together we have about 10,000 square feet of rooftop space on campus which is a lot of room to work with. We are hopeful that the rooftop gardening project will produce an abundant yield of the vegetables mentioned above as well as cauliflower, carrots, onions, garlic, spinach, and tamarind. These are all common ingredients in Indian cuisine served at our Girls Home, Boys Home, and at our Children’s Hope Center slum outreach program. When the rooftop box gardens are complete and yielding their produce, combined with other crops from our farmland such as our lentil harvest, we expect that all of our food except rice will be provided from our own production. As of September, enrollment was up at our India Girls Home by 29 new girls who were rescued from child labor and the dangers of human trafficking. The Girls Home was also expanded to include a new space which comfortably houses 40 orphan girls. The other 30 girls live in the existing space, and all of the orphans are cared for by 5 loving women and widows who live in the Girls Home and serve faithfully. All in all, we are thankful to God that enrollment is up at the Girls Home, and improvements have been made to the campus to make their living situation more enjoyable. We’re also thankful for the widows who help as dorm mothers to the girls, and who also help in the always-busy kitchen along with our diligent kitchen staff. In this way, we’re not only rehabilitating the girls, but giving life, hope, and purpose to widows at the same time. We look forward to sharing news in the future about the box garden harvest, and the continued good work of our team for orphans in India.